Videos on YouTube and 165 of the most popular video sites with bit rates up to 100 KBps. between 100 and 200 KBps. HD YouTube video got stuck 25 times (with a 20 MB connection), while with SPEEDbit Video Accelerator it played smoothly. You should make sure to use the latest version of Video Accelerator to ensure the best performance. and then click Check for Update. You can also visit the Video Accelerator download page to find the latest version. The Main screen of Video Accelerator provides you with a central location to access options, and view the video acceleration status. Click the Supported video sites button to view a list of websites that are accelerated by Video Accelerator. The list details the types of acceleration supported at each site as well as comments on updates or news regarding specific sites. When you purchase your subscription for SPEEDbit Video Accelerator Premium, you receive an Activation Code via your email. 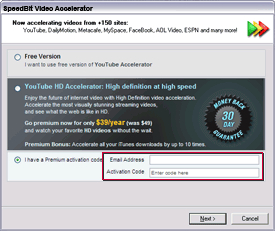 To activate your copy of SPEEDbit Video Accelerator Premium, right-click the system tray icon, and then click Enter Activation Code. Select the I already have a premium version activation code option, and then type your email and the code in the provided fields. 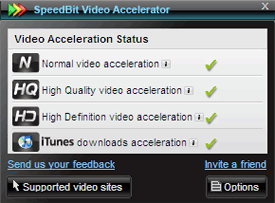 To access SPEEDbit Video Accelerator's settings window, right-click the Video Accelerator tray icon and then click Settings. Additionally you can click the button from Video Accelerator's main screen. Select this option to make sure that SPEEDbit Video Accelerator is running when you startup your computer. Select this option to see the Now Accelerating tray message every time a video is accelerated. 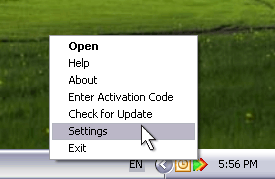 Turning off this option will not affect your acceleration. Select this option to remove the SPEEDbit Video Accelerator Tray Icon from the Windows System Tray. If you use a proxy to access the Internet, you will have to set Video Accelerator's Proxy settings to enable acceleration. Using a proxy is only available when watching videos with Internet Explorer. To allow Video Accelerator to work with a Proxy, select the Set SPEEDbit Video Accelerator as browser proxy option. A script is added to your Internet Explorer Proxy Settings that allows Video Accelerator to work with your proxy. Click the Restore defaults option to return SPEEDbit Video Accelerator to its original settings. Leveraging SPEEDbit's unique technology, SPEEDbit Video Accelerator downloads movies and music from multiple sources simultaneously allowing for significantly improved download speeds and video playback.